Packaging: 36 pack, 10-card waxboxes; Millennium Edition factory sets. Return to a single series. Vintage '61 inserts done in the style of the 1961 Fleer Baseball Greats set. The "Millennium Edition," limited to 5000 sets, first factory set since 1992. Sold exclusively by Shop at Home. 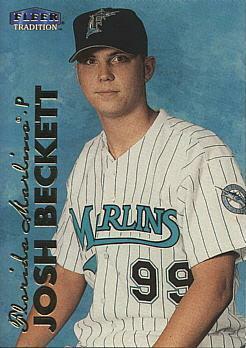 Notable Cards: Josh Beckett and Alfonso Soriano RC. Only RC of Eric Gagne. First ten and last ten cards of '99 Fleer Tradition Update were included in the Millennium Edition factory set.